The guideline will be one year old in a few weeks’ time: how many doctors know what it says? 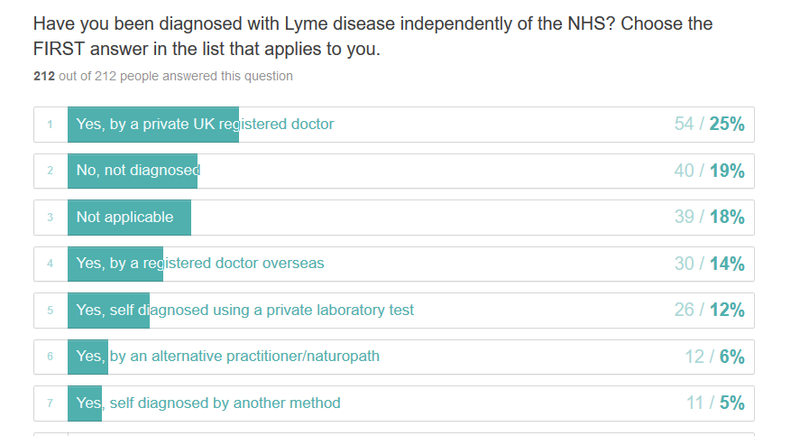 Caudwell LymeCo has just run a survey of 212 UK Lyme disease patients to find out how well their doctors seemed to know and follow the NICE guideline. The survey results we report here are based on the responses given by patients and we have not independently verified them with their doctors or diagnostic laboratories. This was the final question in our survey, asking patients their own impressions of their GP’s knowledge. It tells us half the patients who saw their doctor about Lyme disease had the impression he or she was unaware of the guideline. Let’s go back to the beginning and see what the specific experiences of patients were, leading to this impression. First things first. 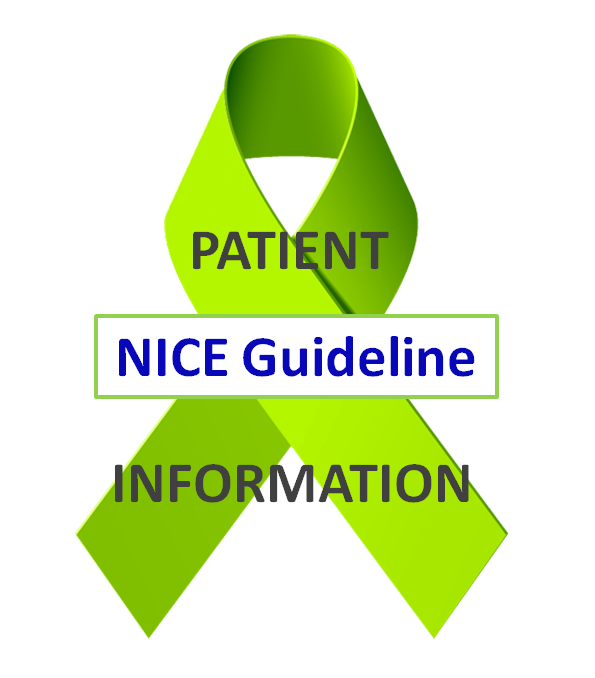 The NICE Guideline officially has force in England, Wales and Northern Ireland, but not in Scotland. Since there is no Scottish Guideline for Lyme disease, it is generally regarded as good practice for Scottish doctors to use follow the English one, however they have more freedom to deviate from it if they wish. 14% of our respondents said they live in Scotland. 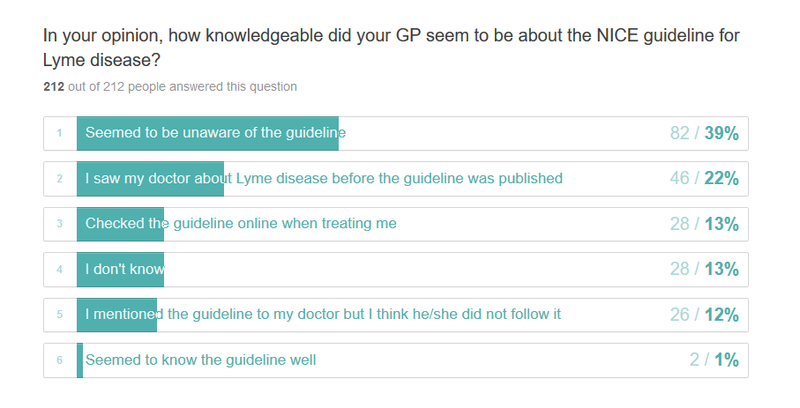 Just over half our respondents, 58%, said they believe they contracted Lyme disease before the NICE guideline was published. 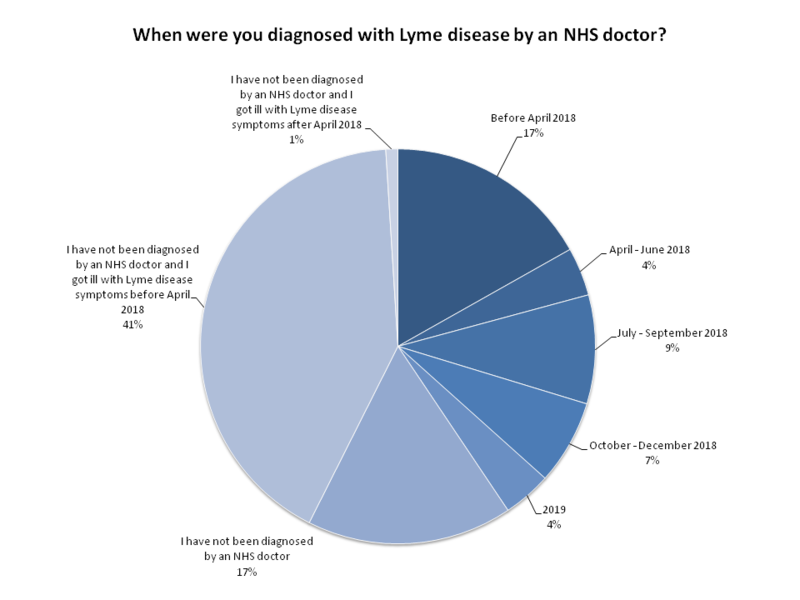 We have seen the below ball-park statistic before, so we thought it was interesting to have it confirmed; 65% of respondents said they did not see a tick biting them prior to developing Lyme disease symptoms. An “erythema migrans” rash is proof of Lyme disease. It is completely reliable, whereas the two-tier blood tests are used by the NHS are about 80% at best (if you believe the four existing research papers about them, which are cited in the NICE guideline). 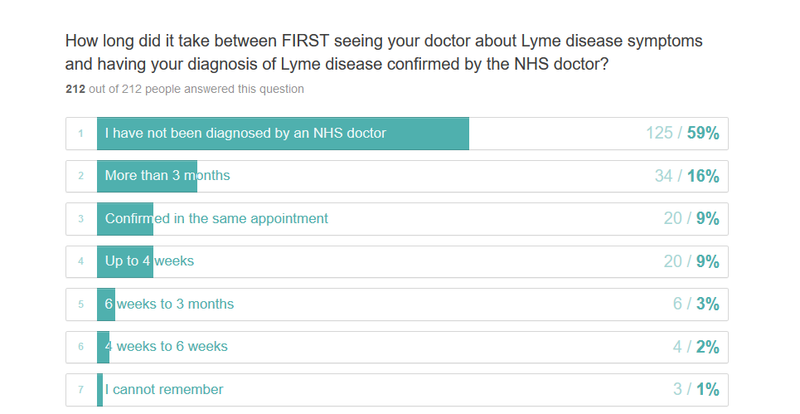 We were interested in whether doctors are prescribing treatment for Lyme disease when they diagnose this rash, or whether they are also ordering a blood test. 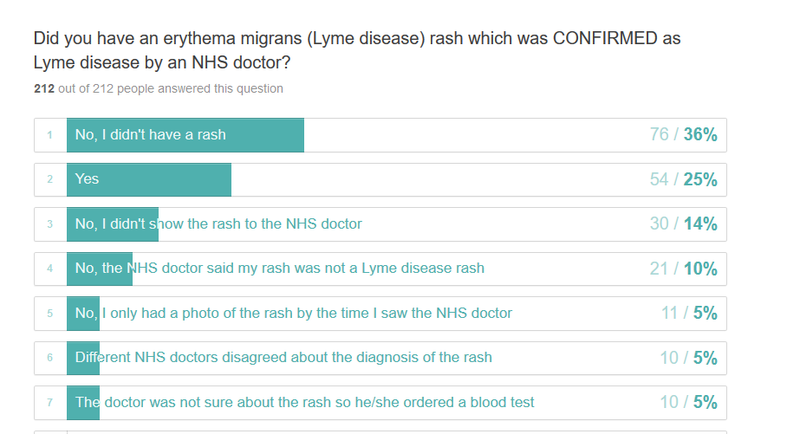 Apparently 25% of our respondents had a rash which their doctor confirmed as a Lyme disease rash. 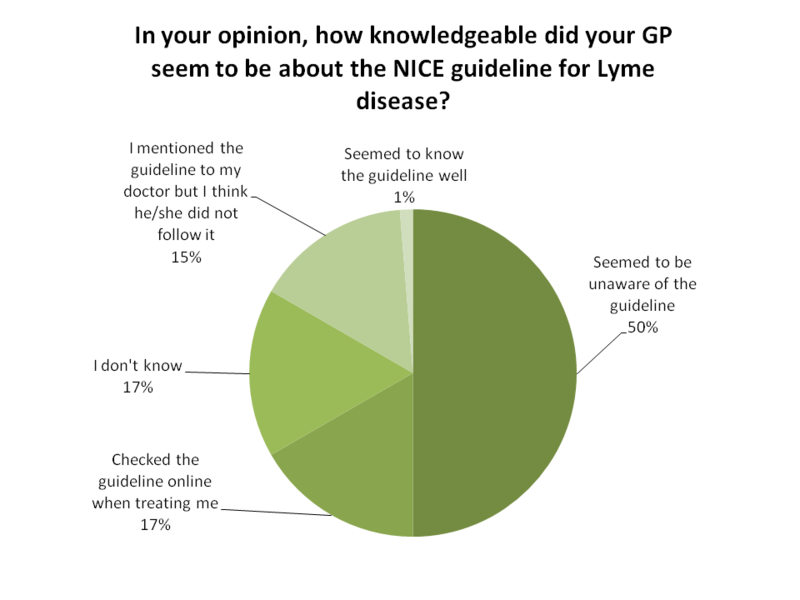 However, despite 25% of people having recognised rashes, only 5% were prescribed treatment for Lyme disease without a blood test as the NICE guideline recommends. This means that a hefty 80% of people with Lyme rashes are subjected to a LESS reliable blood test when they have already been diagnosed with definite Lyme disease, against guideline recommendations. We were interested to learn that an eighth of people got ambiguous blood test results in their first test. This is a bit more evidence that the blood tests are problematic and often happens because it takes a full 6 weeks for most people to develop antibodies to Lyme disease bacteria. 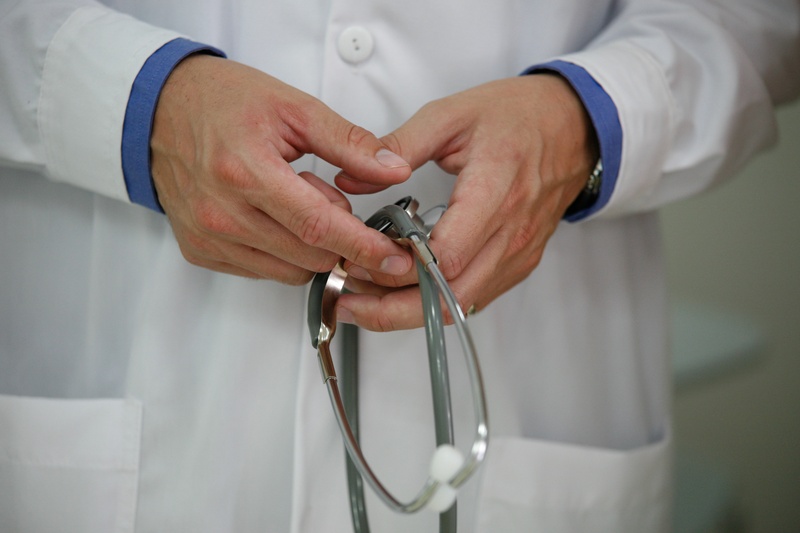 Because of the time taken to develop antibodies, the guideline tells doctors to order a repeat test after 4 to 6 weeks if the result is negative or ambiguous. 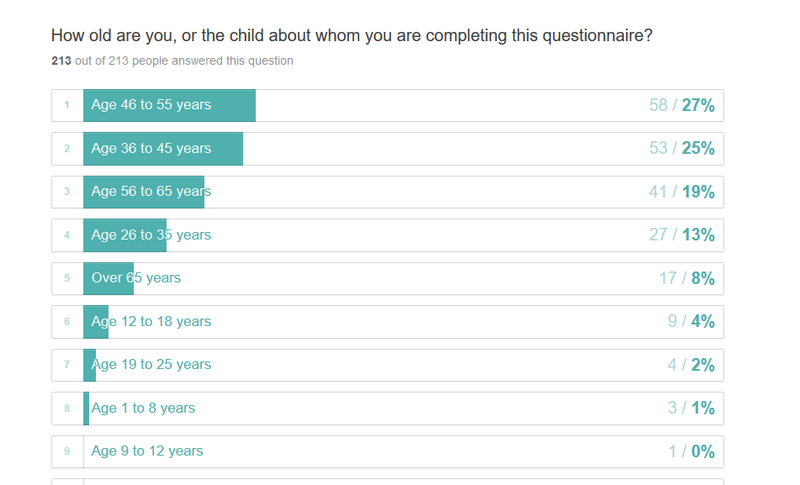 Apparently only 10% of survey respondents did have a second test ordered in the right time frame, even though 65% of them received an ambiguous or negative result in their first test. This means 55% of people’s doctors seem not to have followed the guideline advice on ordering repeat tests. 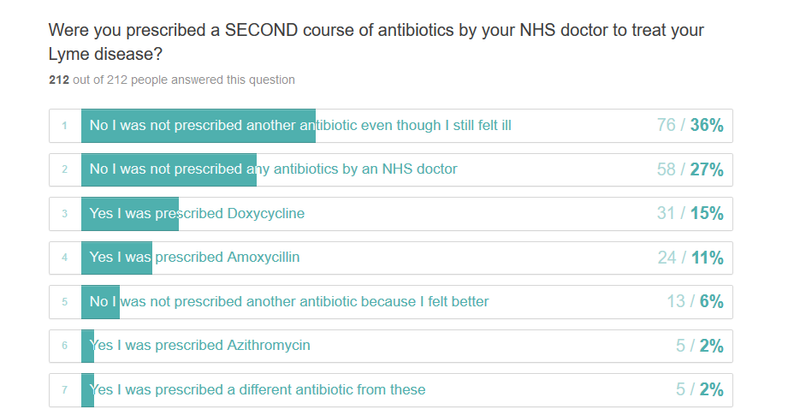 We listed all the antibiotics recommended in the guideline as answer options in our survey and, as expected, most people were prescribed doxycycline. We were surprised that 11% of people were prescribed an antibiotic not included in those recommended in the guideline. This is not specified in the guideline, but appropriate use of antibiotics is essential for successful treatment. Our survey found out that only 6% of people were told not to take dairy products with doxycycline. This is important, as taking milk with this antibiotic can make you absorb only half your dose. We hear from a lot of patients on our helpdesk who tell us they have been prescribed doxycycline and it did not fully work in curing their Lyme infection, and then we find out that they were taking it with yoghurt or milk. 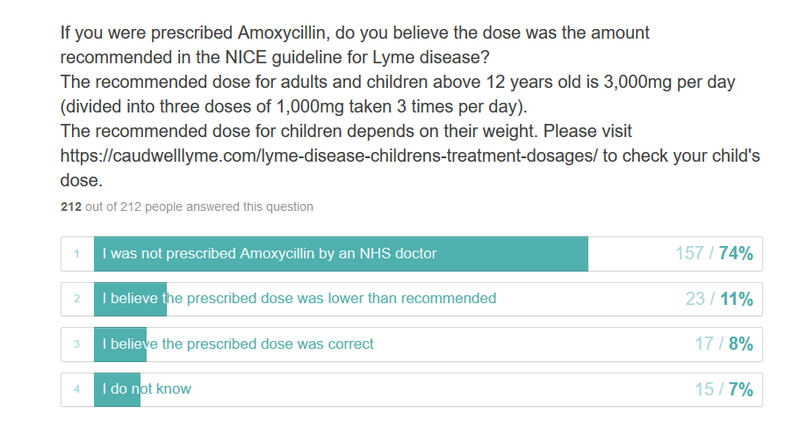 We also hear from a lot of patients who have been prescribed a lower dose of amoxycillin than is recommended for Lyme disease in the guideline. 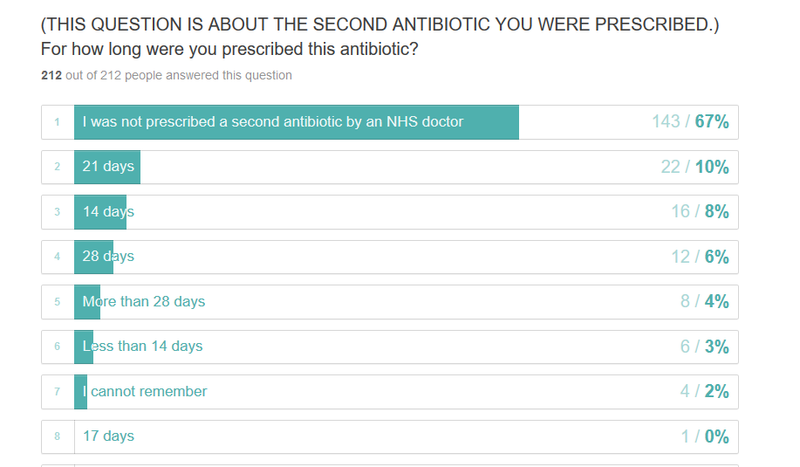 We were curious to find out how many people are under-prescribed this antibiotic. See below for some answers on Lyme disease symptoms in children after treatment, and how long it had been since treatment had finished for the respondents. We captured free comments in our survey and we will publish those in a future blog post.